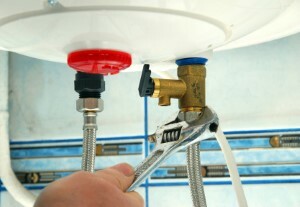 At 1st Choice Plumbing & Drain Cleaning Service, we install and repair water heaters from all manufacturers. Most water heaters are usually a round tank with a heat source that heats water from the bottom of the tank and also maintains and stores the heated water until it is used. Most water heaters have a 40 to 50 gallon glass-lined steel tank. The fuel types used to power the heat source can be either gas (natural or propane), or electricity. The life expectancy of the average water heater is 8 to 12 years. Tankless water heaters are also known as instant water heaters. These units make sense for homeowners for several reasons. In vacation homes they can be very desirable. Here are some of the main reasons why tankless water heaters make sense as opposed to the traditional water heater. 1. Tankless water heaters conserve energy. Traditional water heaters have a tank that is constantly filled with water. The traditional water heater provides hot water in your home by constantly heating the water in the tank to maintain it at a set temperature. Tankless water heaters work differently. Tankless units heat water by activating a set of coils that become hot when the unit is turned on. As the water passes over the coils, it is heated. The temperature set on the control determines how hot the water will be when it comes out of the tap and, thus, how hot the coils become and how quickly the water moves across the coils. Tankless water heaters conserve energy by only heating the amount of water needed at a given moment and by heating the water only when it is needed. 2. Tankless water heaters are perfect for vacation and second homes. When you are not staying in a second home or a vacation home, it is always wise to turn off any appliances and utilities not in use. This saves money and protects your property. Use of tankless water heaters in these second homes eliminates the risk of a leaking water heater tank, eliminates the cost of leaving the water heater running when the house is not in use, and eliminates the long wait when you do use the house while the gallons and gallons of water in the tank reach the desired temperature. If you are looking for Water Heater Installation, please call us today at 250-376-1438 or complete our online request form.